Offering recurring payments can provide many advantages to customers and merchants. For example, customers can conveniently pay for services/products they buy periodically with subscriptions, and merchants with a high number of returning customers on recurring billing can easily predict revenue and lower their customer acquisition cost (CAC). Ecommerce giants such as Amazon creatively add subscription services to their business model to reap some of the benefits; however, other ecommerce services rely on subscriptions and recurring charges in order properly provide their services. Spotify, Netflix, Salesforce and the like need to maintain high approval rates on recurring payments. Many of the same strategies used to achieve higher approval rates on single credit card transactions apply to subscription billing, such as insufficient funds, invalid dates, cross-border restrictions and more. Usually, improving communication with customers can help resolve or prevent many hard and soft declines; on the other hand, subscriptions tend to suffer from lower approval rates because the lack of a card security code (CSC/CVV), at the time of transaction. In this case, no amount of communication with customers will resolve the problem. For recurring billing to work, the customer’s credit card data needs to be saved. However, merchants and financial institutions must comply with PCI DSS, a worldwide security standard, to properly save the cardholder data. Instead of outrightly storing sensitive data, merchants save the information as a token number that is sent to the acquirer or issuing bank for processing each time the subscription is charged. The problem is the issuing bank may still choose to decline the transaction for a lack of CSC/CVV even though there is a tokenization in place. So how can these declines be prevented? Maintaining a close relationship and establishing trust with issuing banks & acquirers can significantly lower the possibility of a decline because of a missing CSC/CVV. EBANX, a local payment platform in Latin America, has formal relationships with major local banks and several acquirers throughout the region. 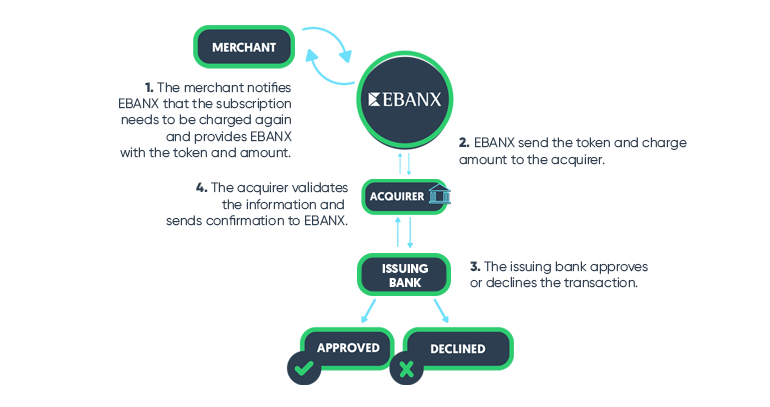 EBANX is able to maintain that relationship because of their prime location and ability to communicate in the native language of the financial institutions, and the company is able to pass those benefits onto their processing merchants who primarily deal in subscriptions. Multiple and local acquiring enables EBANX to smart route the customer’s credit cardbefore tokenization occurs, significantly improving the probability of approval at the gate. Status as Level-1 PCI-DSS Service Provider allows EBANX to maintain solid rapport with local acquirers, ensuring higher approval rates regardless of whether or not a CSC is provided. EBANX is federally compliant with major financial institutions, which establishes their credibility throughout Latin America as a reputable platform of payments. EBANX also takes measures to aid the communication between the merchant and customer by providing the merchant appropriate error codes. When a credit card transaction is declined, EBANX sends the corresponding error code which allows the merchant to determine why the transaction was declined and to notify their customer. This communication between merchant and customer increases conversion rates. Furthermore, EBANX can improve conversion on recurring billing by enabling merchants to accept many payment methods. Spotify is a music streaming service that uses a subscription-based business model. The company recently began operations in Brazil using EBANX solutions: EBANX Boleto Cash Payment & Domestic Credit Card processing, and has since won over the Brazilian ecommerce population. According to Spotify Brands Team, Spotify is the number one music service in Brazil. Visit the EBANX website to find out more how EBANX can help your business achieve higher approval rates on recurring billing in Latin America.